You must make reservations at least 5 minutes in advance of the time at Pomodoro Rosso. Pomodoro, at 229 Columbus Avenue has been a neighborhood favorite for years. 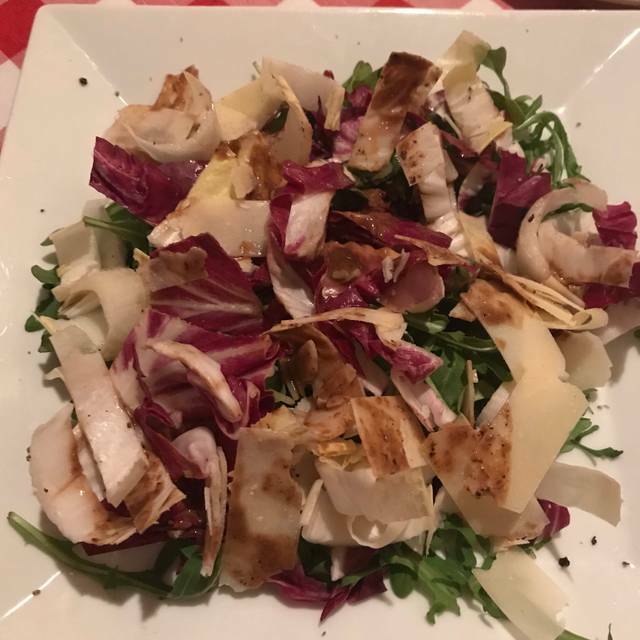 The beautifully prepared Italian classics and excellent service has earned this restaurant a loyal following of Upper West Siders. Beige walls adorned with decorative ceramic plates from Italy, a ceiling trellis with hanging grapes and red and white-checkered tablecloths evoke the feeling of an authentic Italian trattoria. The street side outdoor café is the place to sit and enjoy a glass of wine and savor the antipasti while watching the people stride by. This was our second time back to Pomodoro Rosso. We thoroughly enjoyed ourselves. The food was wonderful once again. 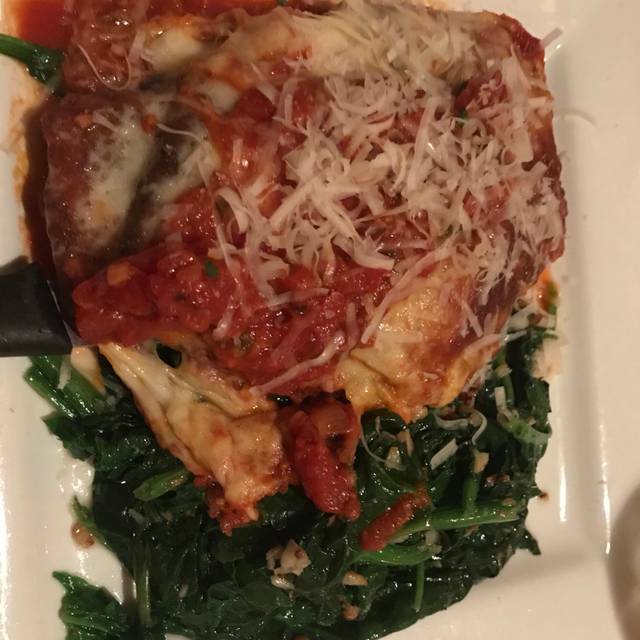 The first time we visited my husband had the lobster ravioli and I had the veal parmigiana. Both delicious. We enjoyed ourselves so much the first time that we decided when we were in town again we would return. 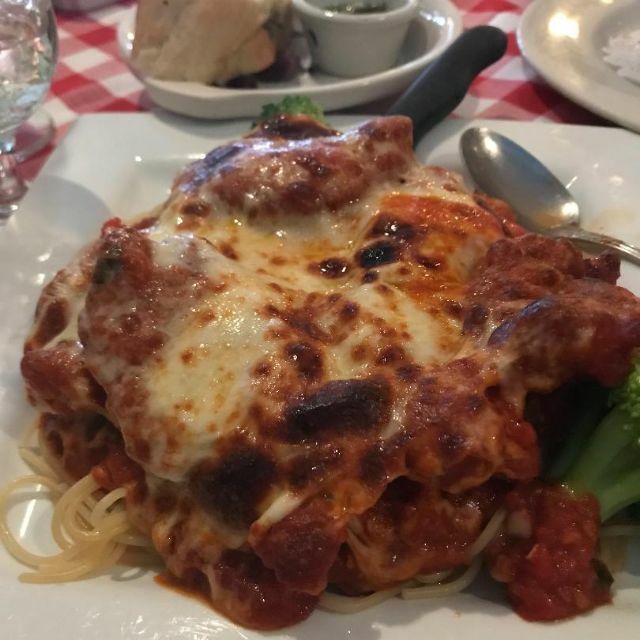 For our second visit I had the shrimp parmigiana and my husband had the spaghetti and meatballs with mozzarella. Again both delicious. We also enjoyed a delicious seafood salad for an appetizer that our waitress recommended. We hope to return again in the future. It's long been a favorite when attending Lincoln Center. 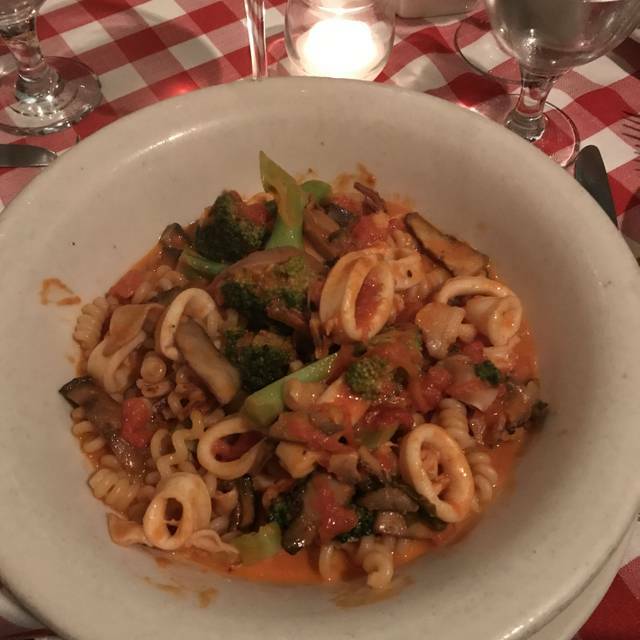 Pomodoro Rosso has become my Go-To place for Lincoln Center neighborhood dining. The food and Service are consistently excellent, the Service is friendly, and attentive, and the value is outstanding. Service was excellent and the food was outstanding. Love this meighbo gem! Come for lunch and always have good food and good service! Disappointed with the food and the value. The cheapest pasta was $26. Two pastas were good, but two were mediocre. The new Rissoto with seafood is wonderful. Sevice was prompt without intruding and very attentive. A great UWS neighborhood restaurant with a long successful history. Oh dear! I'm not sure what happened here but they must have changed chef's. The food has taken a turn for the worse. I'm sorry but I can no longer recommend it. We had a lovely family lunch on a Sunday afternoon, were not rushed by the waiters and were not restricted with the usual brunch menu. We also were given a comfortable table for 6 adults and one baby in a high chair. We asked for a wine recommendation and were delighted with an excellent California red wine. Would like to go back soon! Great place. Everything was terrific. We will be back! Service was a bit off this particular night. The food is always delicious with good size portions. Hidden gem on the upper westside with outdoor seating available! Really delicious pasta dishes and friendly staff! Amazing food and even better service! The manager himself even came over and asked us how we were doing and was above and beyond your standard "how is everything". I would highly recommend this place! This is a place you can come time after time...always full...just think a restaurant that cares not for reviews or how many yelp shouts it’s gets..but still always packed with neighbors that want wonderful food at a good price and a owner that cares wether or not you had a good evening...I will take that and come again this week..
We've been going to Pomodore for years and have NEVER been disappointed. Excellent! Food was average, not exceptional. Service also was not particularly attentive. As usual, Pomodoro does not disappoint. My group of 6 had a great dinner with excellent service. Can not wait to go back again. 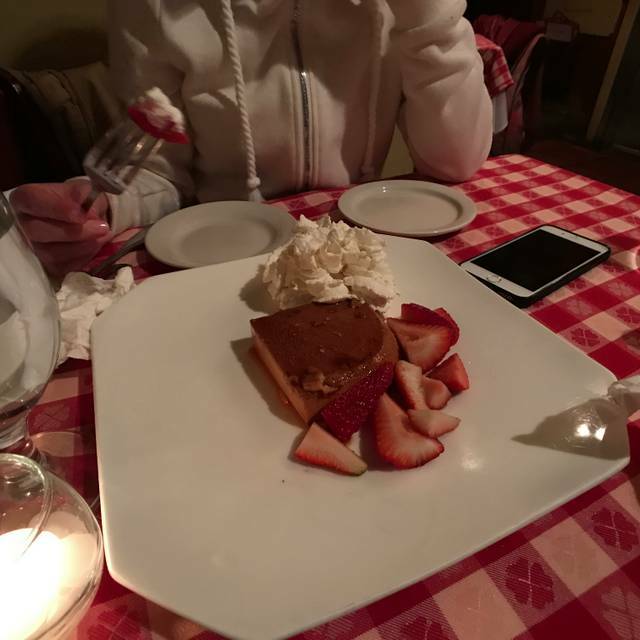 Pomodoro Rosso is our favorite Italian restaurant in NYC. Its food and service is ALWAYS CONSISTENTLY OUTSTANDING and never ever disappoints. We love how relaxed and comfortable this restaurant is. It never disappoints. The food was outstanding, two of us had the fish stew and loved every bite. As an appetizer, we had the pasta misto, but requested it sauteed instead of breaded and deep-fried; it was delicious. We had the wine by the glass, and they were all good and reasonably priced. It is our favorite upper west side restaurant. Arrabbiata sauce is supposed to be spicy and hearty. I had a little mild tomato soup drizzled on my penne. Total disappointment. 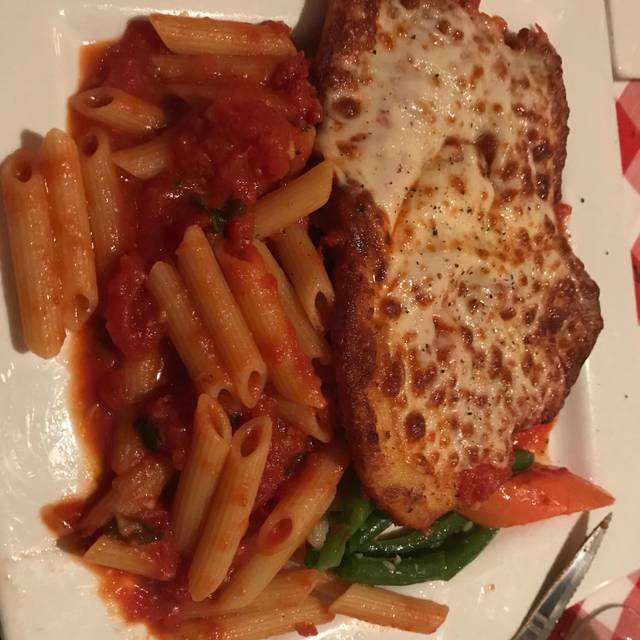 Extremely yummy Italian food. Great ambiance, and the interior will make you feel like you're in Italy. Next time I'm in NYC, I'm going back here. Great food, service, and neighborhood atmosphere. Hard to find at a reasonable price point in NYC. Wish there were more restaurants like this one! Love pomodoro. 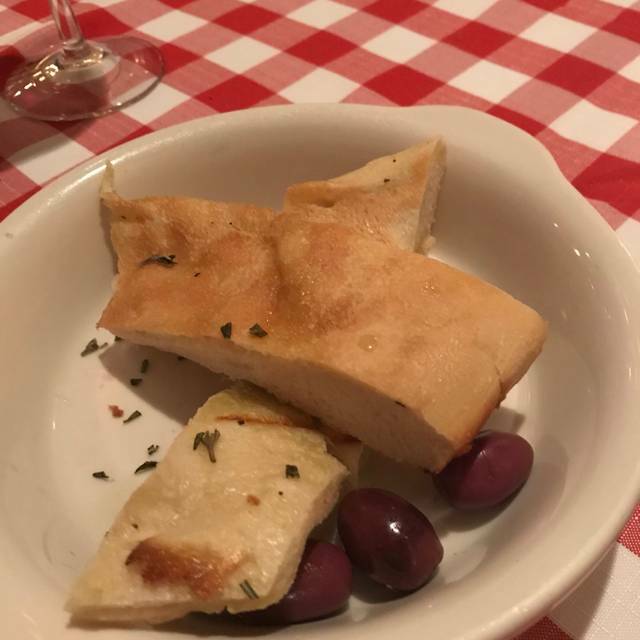 Great cozy quality Italian food. Sehr aufmerksame Kellner, hervorragend gutes Essen zu handelsüblichen New Yorker Preisen. Dispit an accident with spilled red wine this is a place I will go back at. Have been here two times before! This is a warm and inviting neighborhood restaurant with a wide variety of comforting Italian dishes. The portions are large and there is something for everyone on the menu. Now that they take reservations, it is so much more pleasant to arrange for a table as the waiting area in the front of the restaurant is very narrow and can get crowded. I hadn't been there in a long time because of their no reservations policy but now I will be going back to enjoy their delicious food and wine. This is our go to choice when we go to a performance at Lincoln Center. The food is good and well priced for the area, the service is efficient and we are always in our seats with plenty of time before the curtain goes up. I went to Pomodoro Rosso with my two daughters on a Saturday evening before the opera. Our meals were delicious. The wait staff was very friendly and accommodating. And we received the prompt service we needed to make our curtain time. My only complaint was that the restaurant was very hot which made our dining a little uncomfortable, and I am not generally inclined to being hot - it was a somewhat unseasonably warm night, which may have affected the ability to regulate the restaurant's temperature properly. Despite the uncomfortable temperature, I would be willing to give Pomodoro Rosso another try. We are regulars here! The staff is terrific and always the same wonderful group which says a great deal. There are always interesting and exciting special dishes as well as a menu full of so many choices. After many years we still have Pomodoro Rosso on the top of our list! No wonder this restaurant is constantly busy. The restaurant is a neighborhood type place. Small but nice. The food is very good and the service was efficient. Nice place for a good meal. Amazing food, excellent service! A great value for dinner in NYC in a relaxed, family atmosphere. Will definitely return to try more of the menu! Lovely ambiance; great food and service. We’ll highly recommend. We had a delicious lunch and it was quiet enough for talking. Fresh food. Nicely presented. Liked cozy atmosphere. Loved the fact that you can get items other than usual brunch items for brunch. Liked idea if entree type dishes for brunch.